Over the last few years, the general rise in property value has been approximately 23% per annum, showing a massive return on often a small investment. One of the reasons for the great increases in land values, is that businesses now have the confidence in Koh Phangan to be one of Thailand's top travel destinations, another reason is it's such a fine place to live! Thailand is in many ways a perfect country to settle down in. Pleasant climate, reasonable prices, beautiful nature, wonderful beaches and people who are easy to get along with. It is natural that many foreigners are looking for a home and house here. The Phangan Utopia Land & House Estate is a first-class development project on the North West of Koh Phangan Island, an area that is spectacularly beautiful and possesses so many excellent qualities. The over 43,200 square meters (27 Rai) of property perfectly blending everyday living with the natural environment. 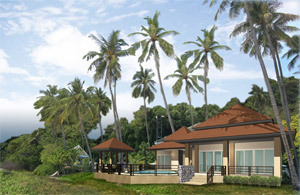 We offer beautiful housing and landscaping designs to ensure you and your family can begin a warm and enriching life with us here on Koh Phangan Paradise Island. Set in spectacular natural surroundings of unspoilt mountains, yet only 0.5 km from Mae Haad Beach, this exciting new development offers a range of luxury residential tropical villas. Breathtaking close ocean views and captivating sunsets over Mae Haad Beach provide these brand new contemporary style villas with a truly beautiful setting. This luxury Phangan Utopia Estate hillside development is located at Thong Lang view point on the stunning North West Coast of Koh Phangan Island; situated on a gently sloping hillside with magnificent views over the bays of Chaloklum village and Mae Haad Beach. This quiet residential site is perfect for those seeking peace and tranquility as the land has a short private drive way keeping the site away from the main road whilst still being situated close to Chaloklum village and Mae Haad Beach at the North Coast of Koh Phangan Island. The Phangan Utopia Land & House Estate comprises 30 luxury villas, all with stunning sea views and resort style tropical gardens. These luxury residential villas were designed to offer maximized use of living space on an area of 180 to 250 sqm, with 2 bedrooms, 3 bathrooms, kitchen, lounge, sala and a swimming pool placed in a lush tropical garden. There are vast landscaped gardens, with many water features plus a sea view terrace commanding sweeping views across the sea to the Angthong National Marine Park. This luxury residential villa is a single storey villa, with many unique style qualities to it. Each property has been meticulously designed by architects successful in hospitality and leisure design, who instinctively know how to delight and satisfy home owners while respecting the physical and cultural setting. With stunning greenery and mountain views, Phangan Utopia's verdant, tranquil environment provides peace and serenity, offering a true escape from the everyday pressures of urban living. The discerning use of design and functionality creates superior living conditions that reflect the natural beauty of Koh Phangan and the lifestyle of Phangan Utopia Land & House. All of our luxury residential villas have been designed to maximize the fantastic views with the comfort of a modern home. The highest quality local material have been utilized to minimize both your total investment cost and on going maintenance expenses. 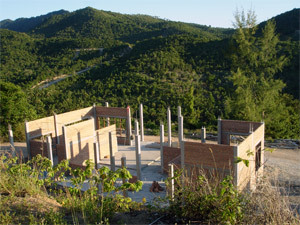 Buyers are welcome to personalize their Koh Phangan Paradise home within certain guidelines with the architect and developer. Each of the Villas projects offers high quality construction, achieved by close supervision by an experienced team and lives up to its name of being a truly 5-star private residence. 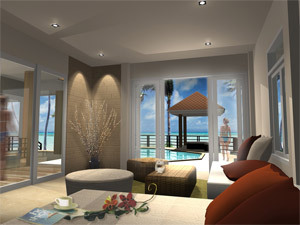 It is competitively priced by Phangan Utopia Land & House to facilitate a quick sale.